As we find ourselves in the early stages of summer here in North Texas, ensuring your lawn receives the adequate amount of water is of the utmost importance. With an efficient irrigation system, you will never have to worry about your lawn looking dull and lifeless this summer. Our Fort Worth TX landscapers with Blooms Landcare take the worry of lawn care out of your hands, allowing you to rest easy all summer long. In order to save time and money, our landscape professionals can instill your lawn with a ground irrigation system, which will save you from having to hold a water hose that doesn’t effectively cover the entire area. Our irrigation experts can determine the size of your lawn and the best course of action to ensure all areas are covered completely. Our sprinkler system installation technicians can also repair your sprinkler system, replacing your system’s broken rotor heads, nozzles, valves, and locating and repairing any leaks that may be occurring in your system. No matter what has gone wrong with your sprinkler system, we can fix it, whether it is adjusting your heads to ensure even distribution or reviewing, replacing, and programming controllers. 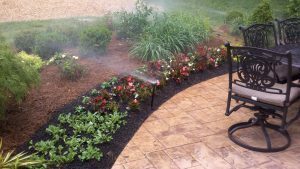 With quality customer service at an affordable price, Blooms Landcare is the company to count on when it comes to installing and repairing an irrigation system in Fort Worth and the surrounding area. For additional information regarding irrigation systems, give us a call at (817) 688-5352 or contact us online today.